I was invited to Hollyfort in north Co Wexford, for the unveiling of remembering the role of Máire Comerford and Aileen K’Eogh in the Easter Rising 100 years ago in 1916. The stone carvings stand in a new commemorative garden by the small bridge over the River Bann and this afternoon’s commemorations included readings, poetry, flag raising, a reading of the Easter Proclamation and sharing stories by members of the Comerford and Keogh family. The special guests included the film-maker Joe Comerford, a nephew of Máire Comerford, and David and Simon Keogh, grandsons of Aileen Keogh’s brother. This afternoon’s gathering was reminded that Máire Comerford and Aileen Keogh were two unlikely revolutionaries. Her mother, Eva Mary Comerford (1860-1949) was three times tennis champion of Ireland. Eva Mary Comerford’s father, Colonel Thomas Esmonde VC (1829-1872), Deputy-Inspector General of the Royal Irish Constabulary, served in the Crimean War and was the first British officer to enter Sebastopol after the siege in 1854. Máire was an observer at the First Dail in 1919. She was present in the Round Room at the Mansion House to hear the Declaration of Independence being read and passed by the 37 TDs present. Máire joined the staff of Eamon de Valera’s newspaper, The Irish Press, in 1935, and worked as a reporter as well as editing the women’s page six days a week for about 30 years. Máire Comerford died at her home in Sandyford the age of 89 on 15 December 1982. When she died she was described as “the grand old dame of Republicanism.” She was buried at Mount Saint Benedict, near Gorey, Co Wexford, in a plot beside her life-long friend Father John Sweetman and Aileen K’Eogh and on the site of the school founded by Father Sweetman. Aileen K’Eogh is remembered for a dramatic jail escape during the War of Independence, and was the patron of Mount Saint Benedict, Father Sweetman’s school. Earlier in the day, I had been invited to preach at the Parish Eucharist in Christ Church, Delgany, Co Wicklow, where the Rector is the Revd Nigel Waugh. After lunch and warm hospitality at the Rectory with Nigel and Heather, two of us drove through the Glen of the Downs and the beautiful Wicklow scenery, for a walk on the beaches in Ballymoney, north of Courtown, Co Wexford. There are two beaches in Ballymoney, and I was last on the beach there in August last summer. But the waves were so choppy and the tide was so high it was impossible to check out reports that much of the North Beach has been washed away by recent storms. Most houses in Ballymoney are holiday homes and on a sunny, summer bank holiday weekend, these beaches can be crowded, and long queues form up outside the local shop. Some of the housing estate are full of holiday houses and have only a few permanent residents. So it was a gentle surprise to see so many local people there this afternoon for a walk on the beaches and to enjoy the waves and the tide. After this afternoon’s commemorations in Hollyfort, we returned through Gorey and the Glen of the Downs. but where are you going to see Jesus? The Third Sunday of Easter. Readings: Acts 9: 1-6, [7-20]; Psalm 30; Revelation 5: 11-14; John 21: 1-19. I was looking back on old diaries last week, and I think the last time I preached here was almost 12 years ago [30 May 2004], when I spoke about my work at the time in the field of Muslim-Christian dialogue. Since then, of course I have kept in touch with this area. There have been weekend walks on the shoreline in Kilcoole and Greystones, and then a recent lecture in Kilcoole on Sir Thomas Myles, and his role in key events 100 years ago. Your rector [the Revd Nigel Waugh] has been a good friend for the past 20 years, and as the editor of the Church Review generously indulges me with a two-page spread each month, which, I suppose, provides me with my own modest claims to fame in this diocese, my own chance to introduce readers to my snatches of heaven, and which I like to think of as one of my little successes as a writer. 1, What is your idea of fame? When I was a child, just as I was about to become a teenager, I became a keen autograph collector. My uncle, who was my godfather, bought me an autograph book, and I set about eagerly seeking the autographs of great footballers, pop singers, movie stars – and my first girlfriend and my school friends – in the early 1960s. The pop stars stopped being No 1 hits just as my taste in music matured. The footballers aged as I became more interested in rugby and cricket. The movie stars’ fame faded as my interests shifted to literature and poetry. My first girlfriend lost interest in me. I moved town, changed schools, lost touch with many childhood friends, and I lost that autograph book about the same time. But I do remember basking in the light of Bobbie Charlton and Brendan Bowyer for a few weeks in my old schoolyard. I suppose I saw it as a sort of vicarious fame. And I don’t suppose we stop behaving like that as adults with our own adult versions of autograph-hunting: asking authors to sign books … as if they had given them to us personally; standing in for ‘selfies’ with the good and the great … not that visitors looking at our photographs at home could ever imagine I am a personal friend of so many Popes or Patriarchs, Poets or Presidents. But who do you want to be photographed with, and who will want to be photographed with you? Who do you recognise, and who recognises you? Would you recognise Jesus on that seashore that Easter morning? Where do you see Jesus this morning? Where do the refugees see Jesus when they land on the seashores of Greek islands like Lesbos and Samos? I certainly hope they see the love of Jesus in the work of mission agencies such as Us or USPG, working with local people to help them in their plight. The Apostle Paul, who at first found it difficult to recognise Christ (Act 9: 5), later describes Christ as the image of the invisible God (II Corinthians 4: 4; Colossians 1: 15; c.f. John 1: 18, 12: 45, 14: 9; Hebrews 1: 3), he is an icon or an image of God. When these refugees look at those workers on those islands, I hope they see the image of Christ, the likeness of the Lamb, an image of the Good Shepherd? 2, What is your idea of heaven? There are places I go to regularly, that are part of my life story, and that I often think give me a little glimpse of what heaven must be like: the road out from Cappoquin towards the Vee, past my grandmother’s farm; the Cathedral Close in Lichfield, under a star-filled night sky in summer; the banks of the Slaney, between Bunclody and Enniscorthy, or further down as the river flows into Wexford Harbour; the beaches of Kilcoole and Greystones, Skerries and Portrane; the road from Iraklion to Rethymnon in Crete, facing the sun as it sets in the Mediterranean. But what is your idea of heaven? … Fishing, Golf, Horses, a day’s sailing? The refugees who arrive on our shores, the shores of the European Union member states, are fleeing their own hell on earth. Are they going to catch a glimpse of heaven when they arrive? Or do they find we have priorities other than the Kingdom of God? 3, What do you mean by success? The disciples that Sunday morning are not very successful, are they? (John 21: 3). So unsuccessful are they that they are willing to take advice from someone they do not even recognise (verse 4 ff). The disciples are at the Sea of Galilee or Sea of Tiberias, back at their old jobs as fishermen. Peter, who denied Christ three times during his Passion, Thomas, who had initially doubted the stories of the Resurrection (see John 20: 24-29), Nathanael, who once wondered whether anything good could come from Nazareth (see John 1: 46), James and John, the sons of Zebedee, who once wanted so close to him that they wanted to be seated at his right hand and his left in the his kingdom, and two other disciples who remain unnamed … how about that for fame, lasting recognition and success? They are back on the same shore where there once was so many fish, so much bread left over after feeding the multitude, that they filled 12 baskets (John 6: 1-13). There’s not so much fish around this time, at first. But then John tells us that after Christ arrives 153 fish were caught that morning (verse 11). This number is probably a symbol meaning a complete number. The number 153 is divisible by the sum of its own digits, and it is the smallest number that can be expressed as the sum of cubes of its digits, since 153 = 13 + 53 + 33. Aristotle is said to have taught that there were 153 different species of fish in the Mediterranean. Whatever they say, the disciples must have thought they had managed the perfect catch that morning. But the perfect catch was Christ – and, of course, they were the perfect catch for him too. 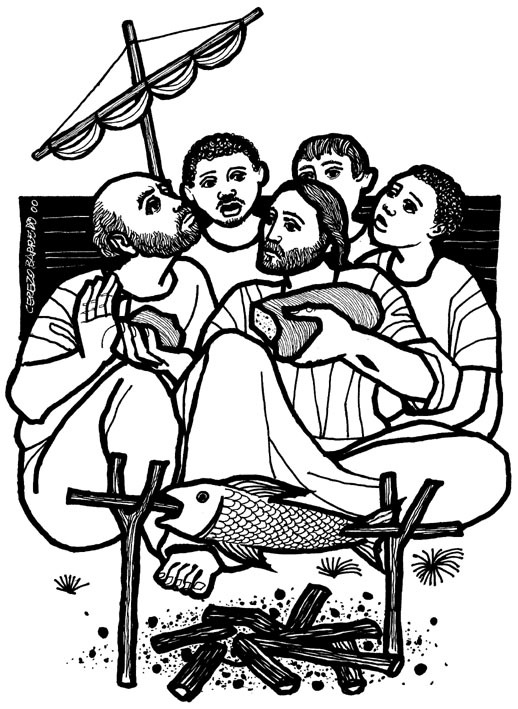 When they came ashore once again he invites them to share bread and fish, to dine with the Risen Lord (21: 12-13). 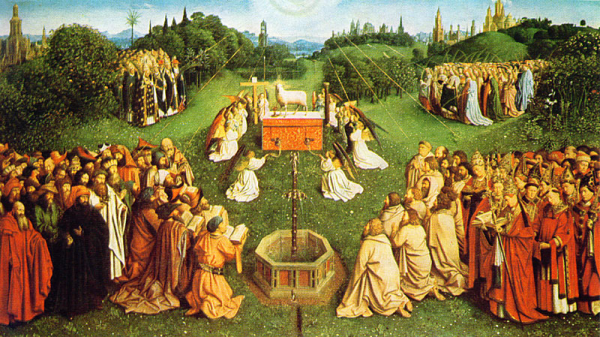 To eat with the Risen Lord and to invite others to the Heavenly Banquet, so that every creature in heaven and on earth and under the earth and in the sea can say ‘Amen’ before the Throne of God … now that’s what I call success (Revelation 5: 11-14). Those are my three questions. But Christ has three questions that he puts to Peter this morning. They appear a little confused or repetitive in most English translations, but the difference is clear in the original Greek. In his first two questions to Peter, Christ uses the verb ἀγαπάω (agapáo). The first, στοργή (storgé), is the affection of familiarity; the second is φιλία (philía), the strong bond between close friends; the third, ἔρως (eros), he identifies not with eroticism but with the word we use when we say we are in love with someone; and the fourth love is ἀγάπη (agápe), the love that takes no account of my own interests, that loves no matter what happens – it is the greatest of loves, it reflects the love of God. Perhaps, the first time, Christ asks: “Simon son of John, do you love me more than you and your friends love one another but in the way God loves you?” (John 21: 15). But Peter is either evasive or misses the point, and answers with a different verb: φιλέω (phileo): “I’m fond of you, I like you like a brother, I agree with you. I’m OK, you’re OK” (verse 15). 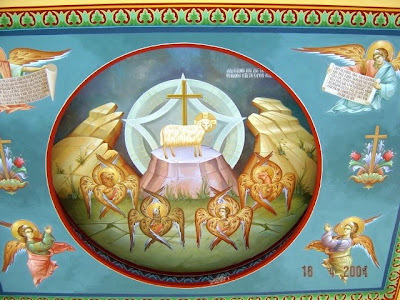 “OK,” says Christ, “feed the little ones the Good Shepherd welcomes into the fold” (verse 15). Then a second time, we can imagine him asking more simply: “Simon son of John, do you love me the way God loves you?” (verse 16). But Peter once again misses the point, and answers with the verb φιλέω (phileo): “I’m fond of you, I like you like a brother, I agree with you. I’m OK, you’re OK” (verse 16). 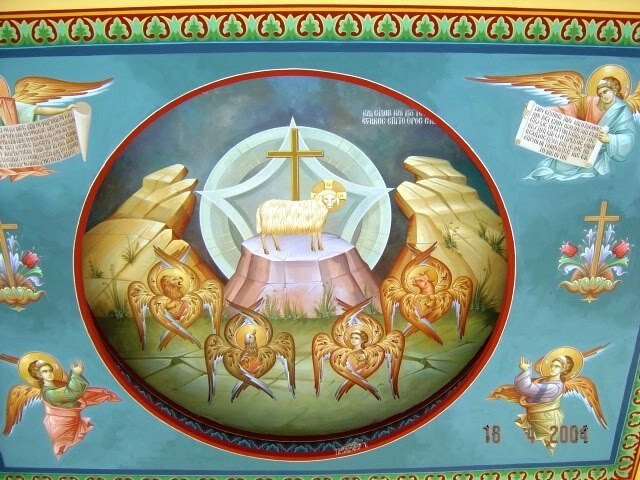 “OK,” says Christ, “look after those in the flock the Good Shepherd tends” (verse 16). But then he asks a third question: “Simon, son of John, do you love me?” (verse 17). Our English translations say Peter was upset, felt hurt, when Christ asked him a third time. We might be tempted to think this is because he was asked the same question repetitively, three times, that his answer was not listened to the first or second time round. But this third time, Christ asks a different question, using Peter’s verb φιλέω (phileo), as if to ask: “OK Peter, do you love me as your brother?” (verse 17). This time around, Peter replies using the same word Christ uses in his third question. But, more importantly, he confesses Jesus as Lord (verse 17), as Lord of everything. This confession of faith comes the third time round from the disciple who earlier denied Christ three times (see John 18). 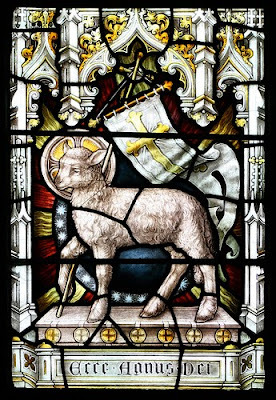 And Christ then asks him to feed the whole flock, all the sheep of the Good Shepherd, lambs, ewes, lost ones, found ones, the whole lot (21: 17). The disciples do not recognise Jesus as he stands on the beach just after daybreak (verse 4). Paul fails to recognise Christ – even when he falls from his horse he calls out: “Who are you?” (Acts 9: 5). But despite their initial blindness, their initial failings, their initial denials, God continues to call them. And so too with us. God calls us in all our unworthiness to feed his lambs, to tend his sheep, to feed his sheep, not just the little ones, not just the big ones. Do you love him enough, as he loves you, to see this as enough fame to bask in? Do you love him enough to feed his little ones when others want to ignore them, despise them, call them racist names, see their children as extra added burdens, want to send them back? Do you love him enough to see this as the benchmark against which you and I, society, the Church, priests and people together, all we are involved in, mark how we relate to the myriads and myriads, the thousands and thousands, to all living life? And so may all we think say and do be to the praise honour and glory of God, + Father, Son and Holy Spirit, Amen. (Revd Canon Professor) Patrick Comerford is Lecturer in Anglicanism, Liturgy and Church History, the Church of Ireland Theological Institute. This sermon was preached in Christ Church, Delgany, Co Wicklow, on the Third Sunday of Easter, 10 April 2016.